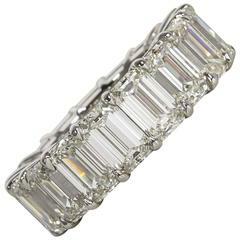 An EXCEPTIONAL piece, only found in the worlds highest jewelry houses. 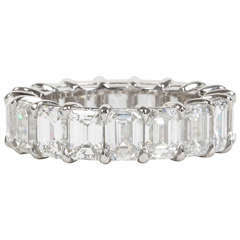 Important emerald cut diamond eternity band featuring 12 Emerald Cut diamonds each with its own GIA certificate. The 12 diamonds make up a total of 18.51 carats. 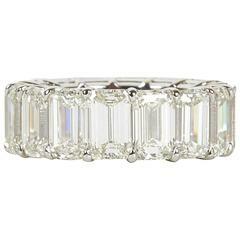 Each of the diamonds weighs an average of 1.54 carats - all cut to the most ideal emerald cut proportion. The diamonds are all colorless white D, E, and F color. Clarity ranges from VS1 to Internally Flawless. Set in a custom made platinum mounting Currently a size 5.5 , but can be adjusted slightly.